Today we had the amazing opportunity to have the Youri Dekker visit our class and give not only a presentation on lighting and 3D sets, but also give some critiques to our short films! After we pitched our story for “Failed to Send”, he made some suggestions about their clothing. 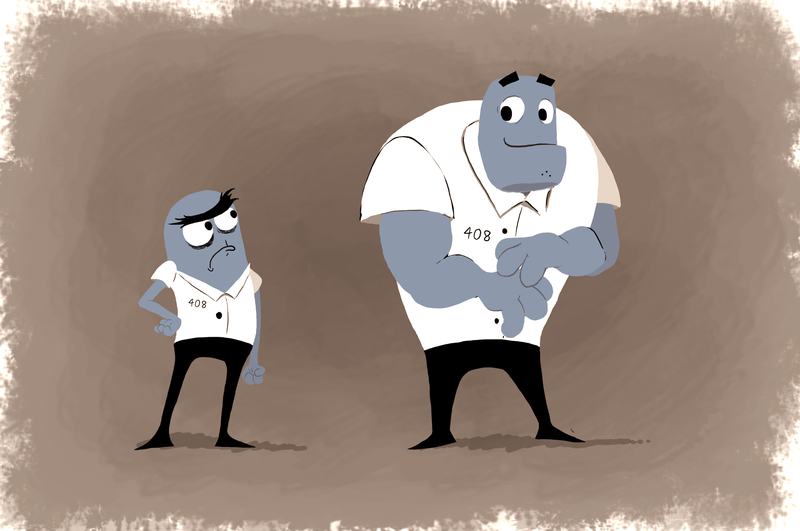 Since we are going for more a simplistic, cartoony animated short, he told us to take a look at another short called “Alike” and to see how it tackled making business clothing simple and stylistic. You can see in the following trailer that the skinny, tall blue character is wearing nothing more than a collar and a tie, and yet we read it as business attire. 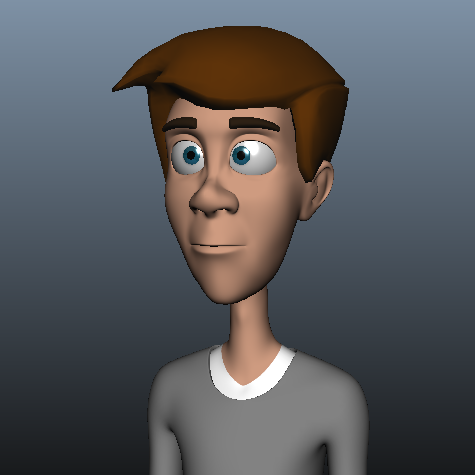 For my second animated shot I wanted to use the Malcolm rig from AnimSchool.com. But a big thing I’ve been hearing lately is that Malcolm is used in a lot of shots and in a lot of demo reels out there. So in order to differentiate my shot, I wanted to modify him a bit to change his look so he doesn’t look like the free rig that everyone else has and uses. I started by changing his eye color and altering some of his facial features. By painting a new texture I was able to give him a long sleeve sweater with a white undershirt beneath it. 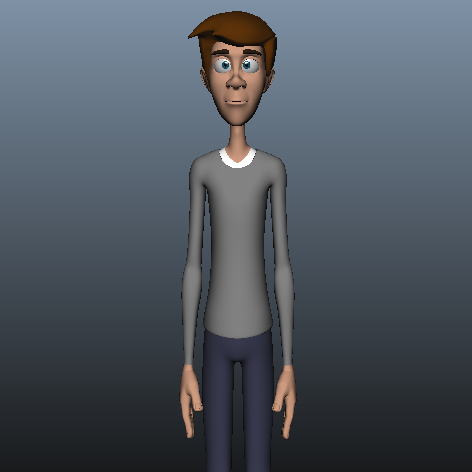 I also changed his hair style by hiding his given hair and importing the hair from the Stuart rig (courtesy of AnimationMentor.com). Here are a couple pictures of what I have him looking like so far! After developing the personalities of our main characters, we realized that our initial designs needed to change to reflect them. Here is another explorative sketch of our two characters. Now that our story is almost complete, we can now focus more of our attention and time on character designs and turnarounds, so expect more character renditions to come! As stated before, the wonderful and talented Youri Dekker visited our class a couple weeks ago and gave us a great lecture on lighting our scenes. The following image is a test render of my second animated shot after I incorporated what I learned from Youri’s Power Point presentation. After pitching our story last week to our teacher, we received a few notes that needed addressing. Our group met last night for 2 hours trying to rack our brains as to how to solve the problems we were encountering. The first issue was that we didn’t open up the short film on our main characters. The second problem was that we needed to figure out what the message said (so the audience can be emotionally invested in the story). And lastly, she did not like the ribbon idea because it would be too complicated to animate in 3D, so we needed to come up with another way to resolve the story. I’m happy to say that we were able to address all of the issues and came out with a story that is even more fun than the original! Here is a copy of what we have for the story so far. Here’s an animatic for my next animated shot this semester. There is still room for improvement but overall I think this shot will be fun! Instead of body mechanics, I wanted this next shot to focus on dialogue and acting. Here is a blurb we made describing what our Undergraduate Thesis is, who is a part of this project, and what we plan to achieve overall. I hope it sheds a little more light onto our short film “Failed to Send”. 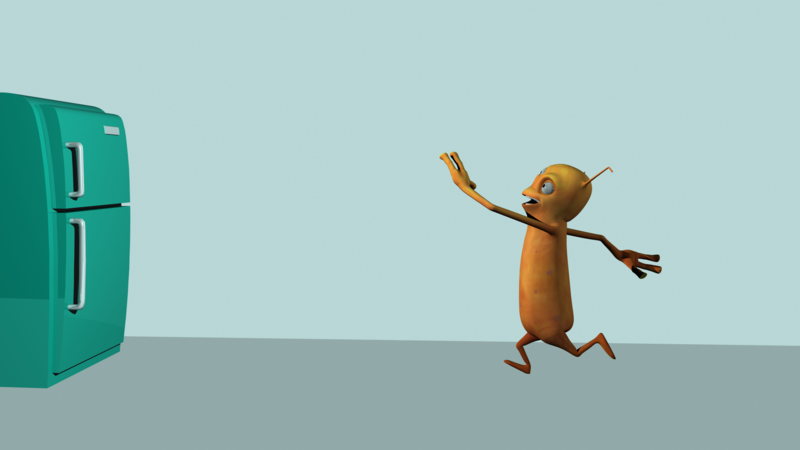 Here is a rendered frame from my first animated shot. I was primarily testing the lighting of the scene but also needed to make sure the textures were working well too. There is going to be some changes before it’s finalized but here’s a picture of my work in progress lighting so far. Thanks to our awesome classmate Paul Barron, we found this great tutorial online that shows us how to use the Toon Shader in Maya. He said he typed the words “Cel Shader Maya” into the YouTube search bar and voilá! Who knew it could be so simple?! This is exactly what we were looking for in order to try to achieve the 2D look we want for our short film. This is the result of transitioning from stepped tangents to splined tangents: everything moves in a slow and swimmy manner. I need to adjust the spacing and build in some moving holds.